The Democratic People’s Republic of North Korea, DPRK, conducted another nuclear test on the 3rd of September 2017, their 6th in a string of tests that started in 2006. 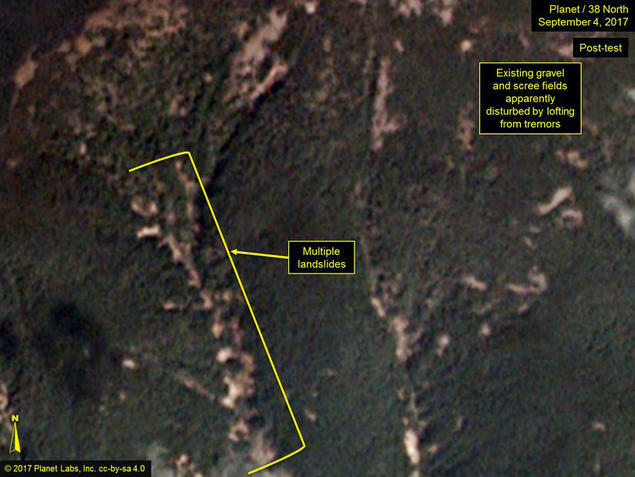 North Korea has a test site called Punggye-ri well observed from commercial satellites and documented on the web site 38 North of the US-Korea Institute at Johns Hoskins SAIS. The mountain providing the overburden for the underground explosions is Mount Mantap situated in the northeastern, interior part of North Korea some 375 km from the capital Pyongyang. There are known to be several entrances to the mountain providing tunnels from which all the tests have been performed. The latest test was conducted using the North entrance. 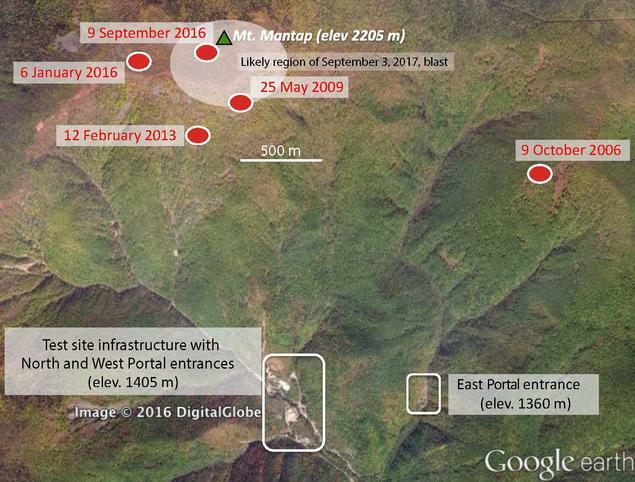 The map below shows the test site with the estimated locations of the five previous tests, as well as our estimate of the location of the recent explosion beneath Mount Mantap. How large was the explosion? 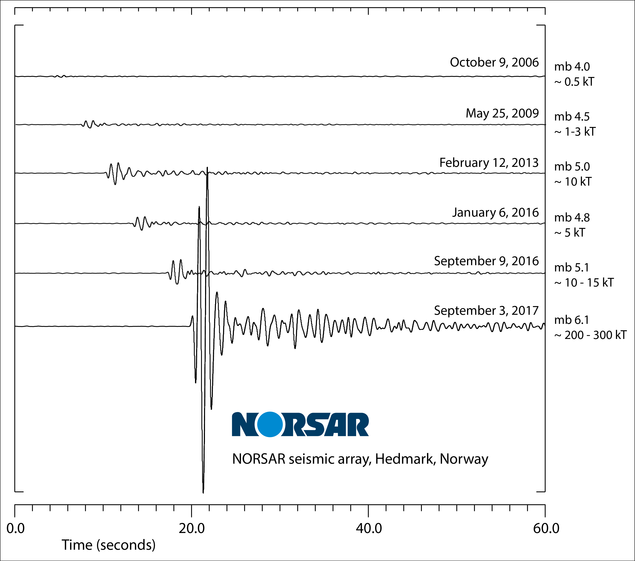 NORSAR recorded the signals from the underground nuclear test explosion on our seismic stations some 7360 km from the test site. The signal took 11 minutes to travel the distance from North Korea to Norway, showing up at our instruments at 05.41 Norwegian time. We have worked thoroughly with the explosion signals to assess the seismic magnitude of this nuclear test and its explosive yield. Our assessment points to a magnitude 6.1 and an estimated yield of 250 kT. This is by far the largest of the tests performed by North Korea. The graph below shows to a common scale NORSAR’s recordings of the signals from the six North Korean tests, with the most recent and powerful explosion at the bottom. where k is a constant representative for a given test site, including its geological conditions. As no reported and reliable reference yields are available for the North Korean test site, we have applied a k-value of 4.3, as has been advocated for the northern Novaya Zemlya test site. By applying a k-value of 4.3, we obtain a yield estimate of 250 kilotons TNT for the magnitude 6.1 nuclear test on 3 September 2017. In comparison, the explosive yield of the nuclear bomb dropped on Hiroshima on 6 August 1945 was estimated at approximately 15 kilotons TNT, while the bomb dropped on Nagasaki three days later was estimated at approximately 20 kilotons TNT. Was it a hydrogen bomb? From the seismological data alone we cannot tell the difference between conventional (fission based) bombs and hydrogen bombs, however it is known that the latter are normally associated with larger explosions. North Korea’s claim of having set off a hydrogen bomb is thus more credible this time. The international monitoring network for the Comprehensive Nuclear-Test-Ban Treaty includes stations to detect airborne radioactivity. This means that if underground explosions leak radioactive particles or gases to the air and these particles or gases hit a monitoring station, there may be an opportunity to address the question of the type of bomb. Neither our radionuclide station in Spitsbergen nor any other station in the international network has so far recorded any radionuclide data that can be associated with the recent nuclear test. What happened to the mountain afterwards? The explosion took place under the top of the mountain with approximately 700 meters of overburden. Approximately 8 minutes after the explosion we recorded another seismic disturbance, with characteristics typical of tectonic events. This may have been a collapse in the tunnel system used for the explosions. Commercial satellites documented the effects from the explosion on the mountain, as presented by 38 North. The picture below – reproduced from www.38north.org – shows effects such as landslides and possible cratering on the mountain. Observers in Pyongyang nearly 400 km away reported movements in buildings in the city at the time of the explosion.